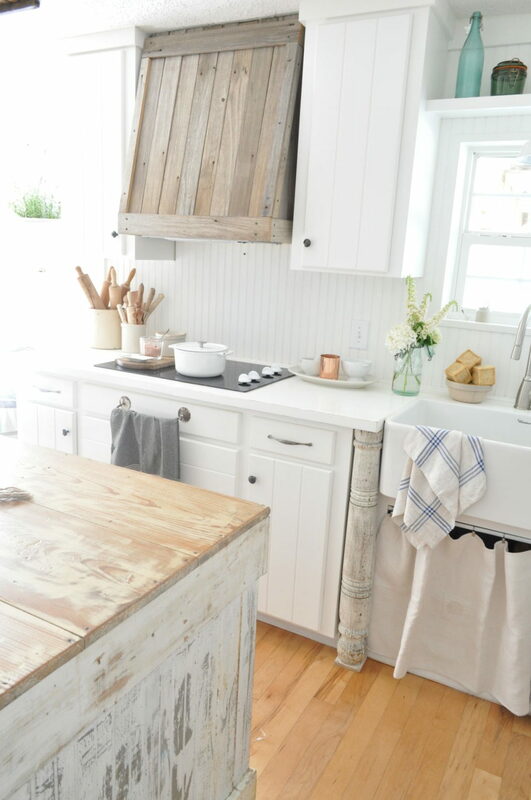 Welcome to the Colors of Summer Blog Tour, hosted by Jennifer at Town & Country Living…where many of my talented blogger friends joined to share our favorite colors for summer decor. The colors of summer are so vibrant, so pretty and bold. 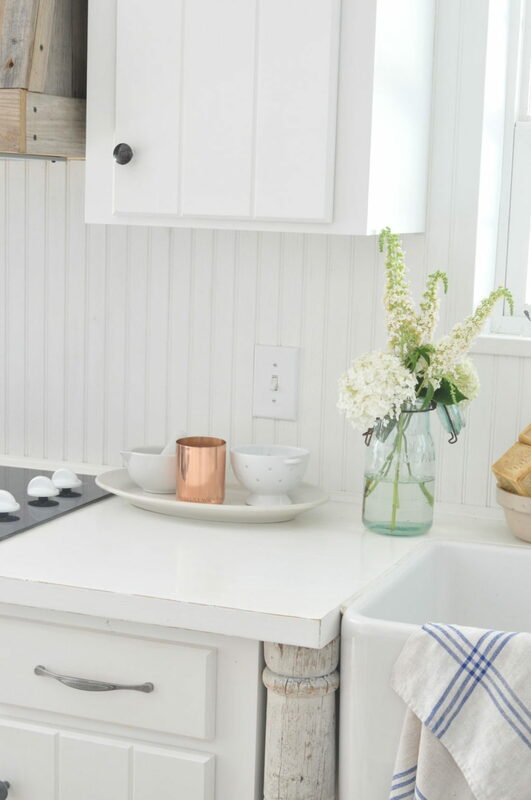 While I do love a beautiful pop of color, today I chose white and copper to use as an accent color in our farmhouse kitchen. 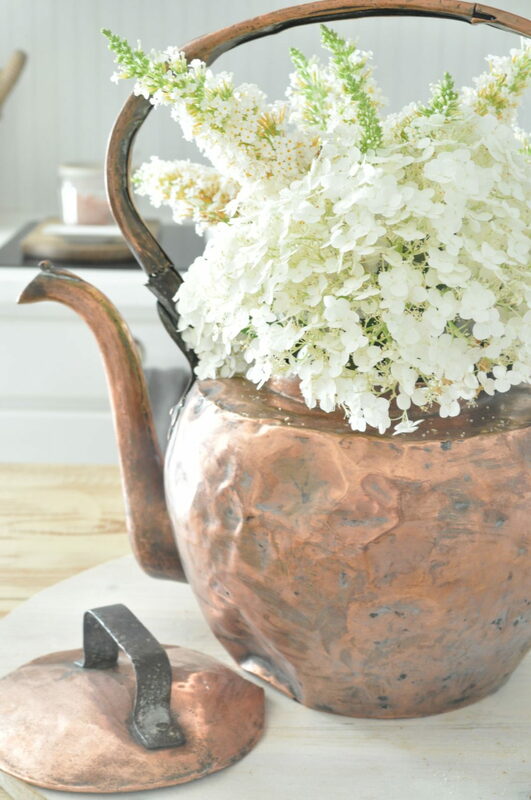 I was inspired by this vintage French copper kettle I found a few weeks ago at a local antique shop. I rubbed ketchup over the entire pot to restore the patina and shine. And, because my garden is overflowing with flowers right now, I filled the pot with hydrangeas and butterfly bush blooms. It makes for a nice centerpiece on our island. I have a few other copper pieces in our kitchen. 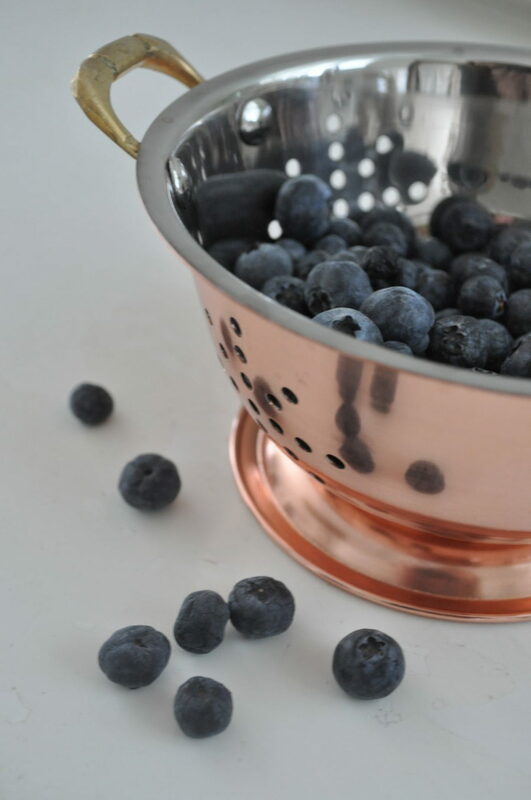 I found a small colander and mini kettle at Homegoods that I have on our coffee station. Although these aren’t vintage pieces, they play nicely with the large kettle. And of course, more fresh white flowers. And lastly, I have a vanilla bean candle from WildLust Wicks in this beautiful copper vessel. It smells heavenly and has a wooden wick that sounds like crackling fire while burning. After it’s burned down, I can reuse it as a succulent vase or utensil holder. And my last copper pieces came from my mom’s collection. She had a few special pieces she found while traveling, and passed them on to me. 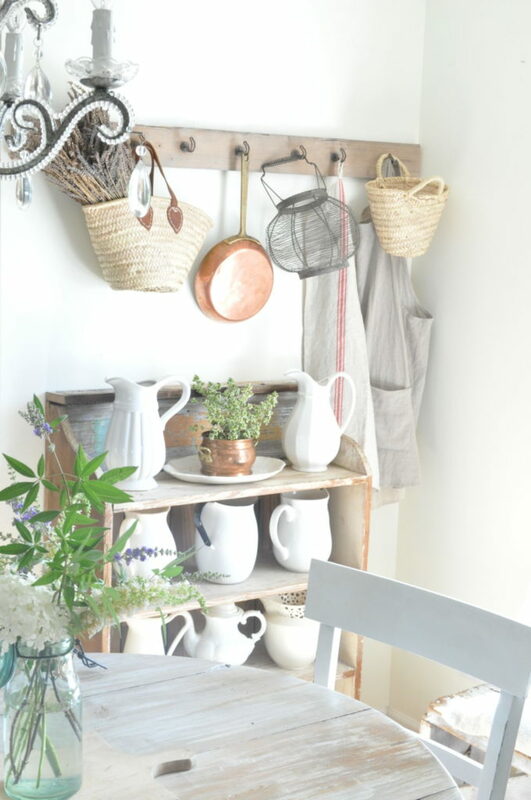 I’ve enjoyed using the saucepan while cooking, and I usually have it hanging on the hook rack for storage and display. I put fresh oregano in the little copper bowl. 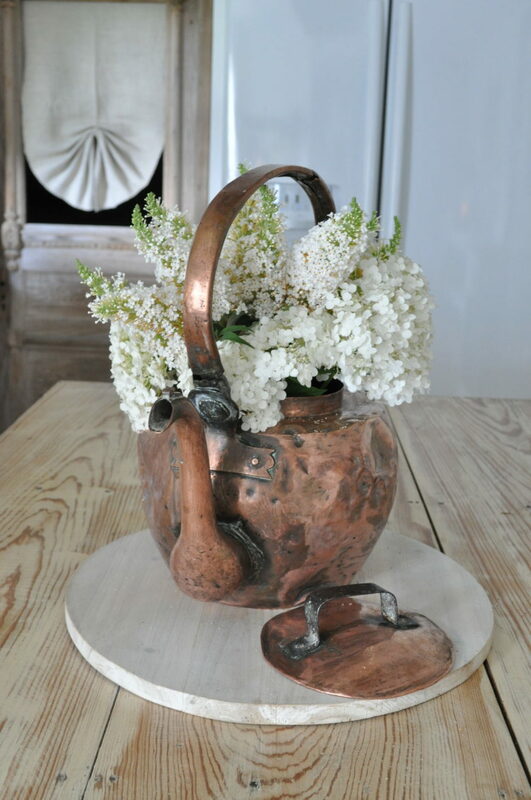 The fresh flowers mixed with copper is a beautiful mix for summertime. 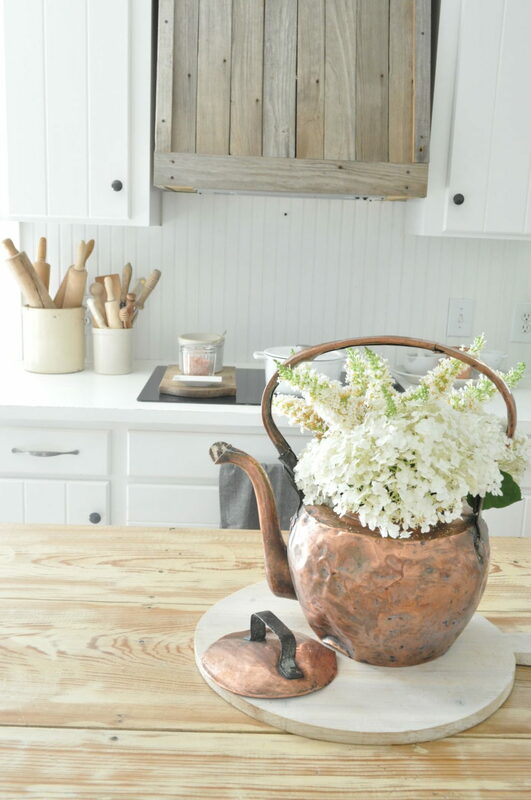 And I love using vintage pieces like the copper kettle to display fresh flowers from our garden. 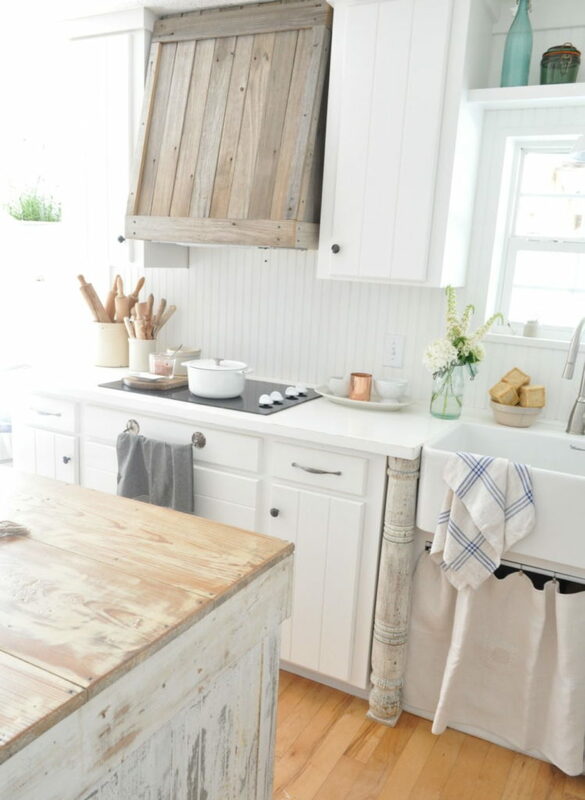 What colors do you enjoy using for summer decor? There are so many beautiful colors to choose from! 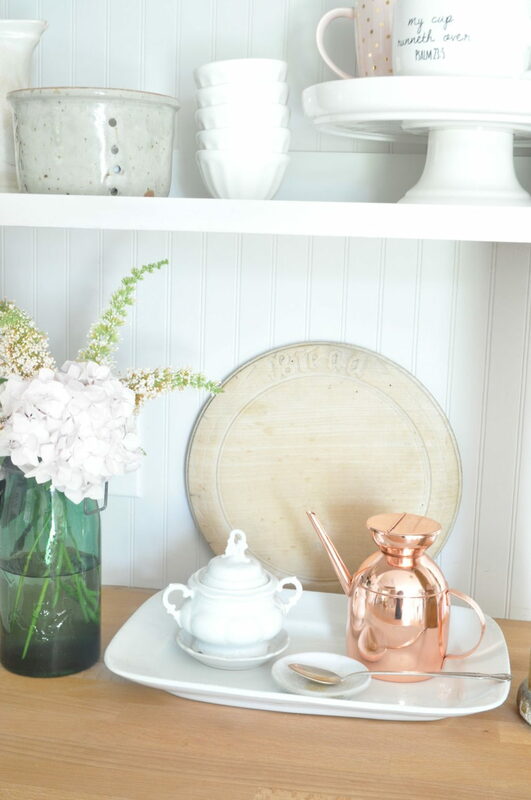 Before you go, please take a minute to browse through the following posts to see how my blog friends use colors of summer in their homes too! And comment below to let me know what your favorite pops of color are during these hot days of summer. Your home is so pretty, Becky. 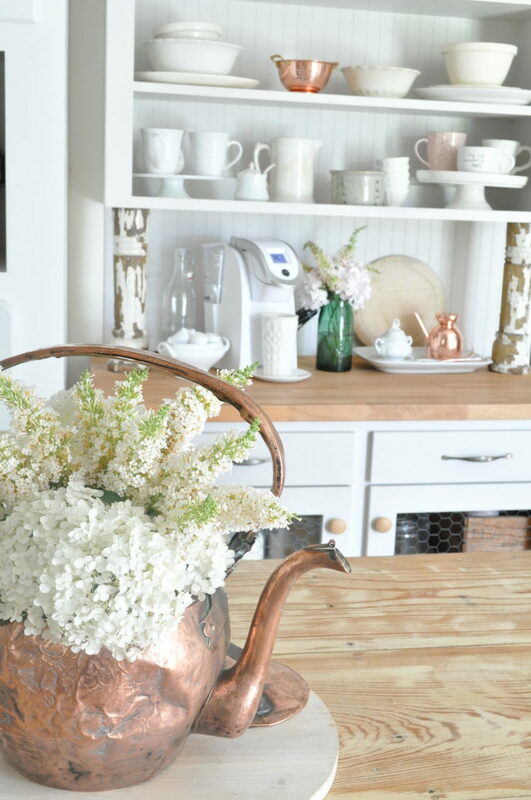 I love that copper kettle and all your vintage touches. Copper! What a great color choice. So unique and I never knew that ketchup would help shine it up. Thanks for that tip, Becky! 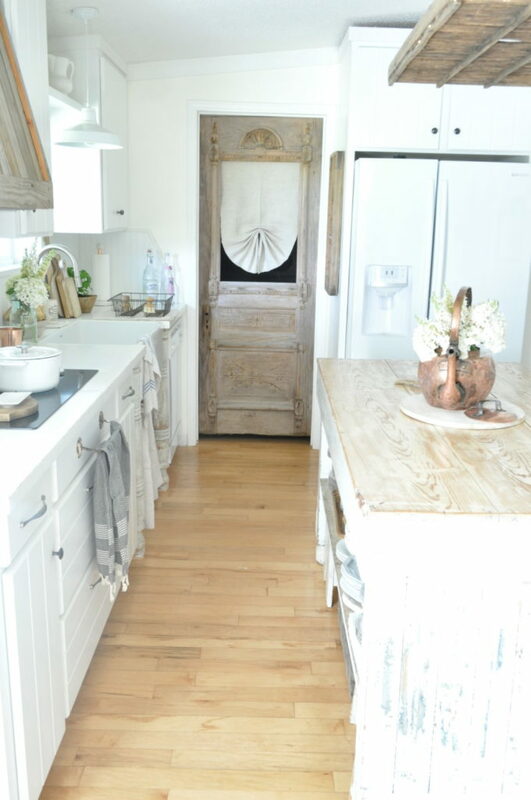 Your kitchen is always a treat to see. 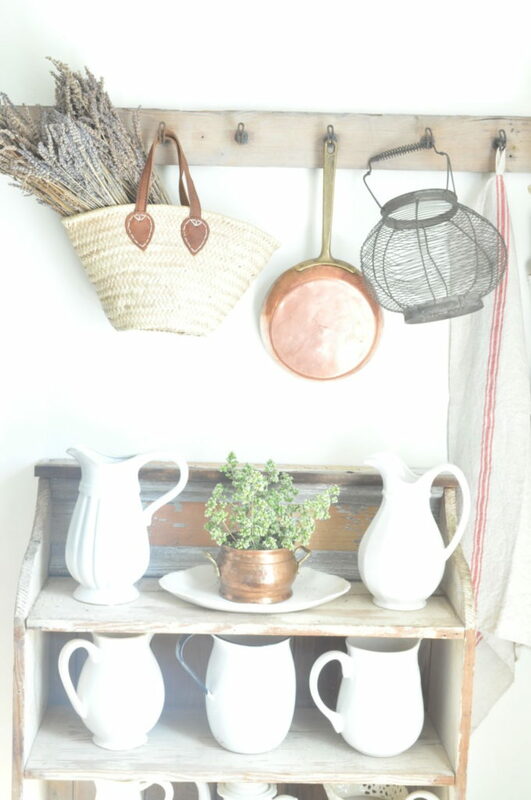 So many great farmhouse goodies to see and store away in this old brain. Too bad it’s so late, after midnight here in western cO. Am a night owl but sleepy is creeping up on me. Will need to come back to this party later tomorrow. Don’t want to miss a thing, it’s all so great so far.